A new Chandra movie shows changes in the Crab from September 2010 to April 2011. Scientists looked to see if Chandra could spot the location of the source of "superflares" in gamma rays observed by Fermi and AGILE. While the Chandra data did not find correlations to those flares, it does help scientists refine their models for what is happening within the Crab. 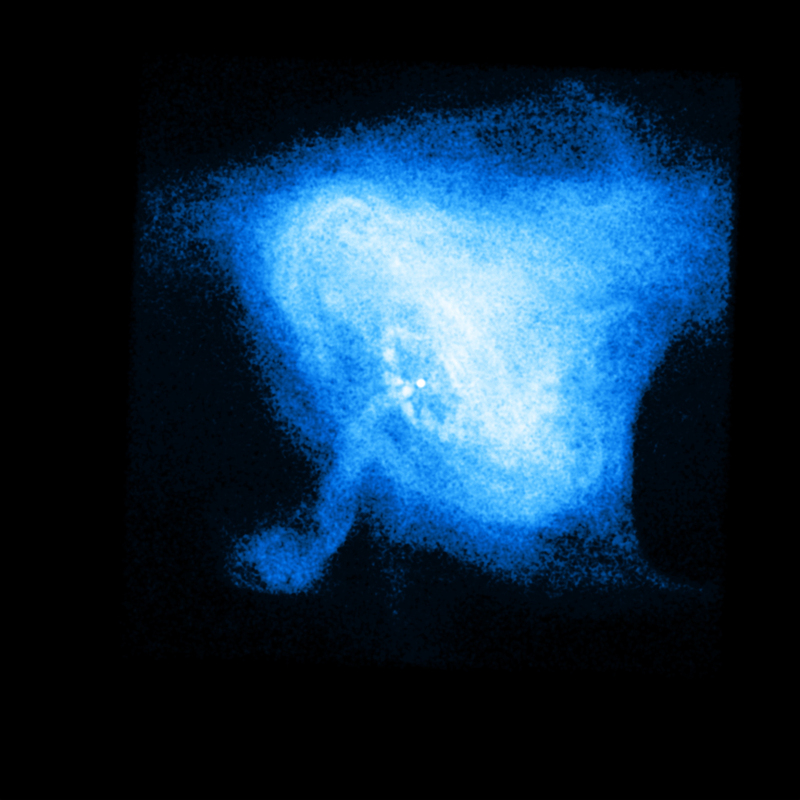 A new movie from NASA's Chandra X-ray Observatory shows a sequence of Chandra images of the Crab Nebula, taken over an interval of seven months. Dramatic variations are seen, including the expansion of a ring of X-ray emission around the pulsar (white dot near center) and changes in the knots within this ring. However, arguably the most striking result of these observations is the variations that were not observed, or in analogy with a famous Sherlock Holmes story1, this could be a case where the fact that the dog that did not bark helps to solve a mystery. The pulsar at the center of the Crab Nebula is a neutron star that spins around about 30 times a second. It was created from a supernova explosion in our galaxy that was observed by astronomers in China and other countries in the year 1054. As the young pulsar slows down, large amounts of energy are injected into its surroundings. In particular, a high-speed wind of matter and anti-matter particles plows into the surrounding nebula, creating a shock wave that forms the expanding ring seen in the movie. Jets from the poles of the pulsar spew X-ray emitting matter and antimatter particles in a direction perpendicular to the ring. The goal of these latest Chandra observations was to pinpoint the location of remarkable gamma-ray flares observed by NASA's Fermi Gamma Ray Observatory and Italy's AGILE Satellite. A strong gamma-ray flare was observed from the Crab in September 2010, followed by an even stronger series of "superflares" in April 2011. The gamma-ray observatories were not able to locate the source of the flares within the nebula, but it was hoped that Chandra, with its high-resolution images, would. Chandra began observing the Crab on monthly intervals beginning six days after the discovery of the gamma-ray flare in September 2010. 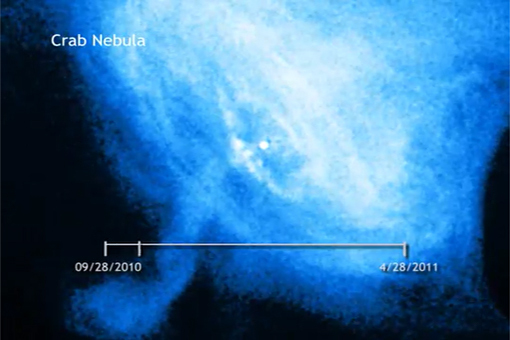 This established a baseline of seven images of the nebula before the superflare was seen just last month. When Fermi scientists saw that more flaring activity was beginning in April 2011, a pre-planned set of five Chandra observations was initiated. Two of these observations were made when strong gamma-ray flares occurred, but no clear evidence was seen for correlated flares in the Chandra images. The movie shows the April observations in "slow motion" to focus on the time when the gamma-ray superflares occurred. The movie shows three loops through the sequence of images, along with a timeline near the bottom. Despite the lack of a "barking dog" in the X-ray data, these observations, as in the Sherlock Holmes story 1, will help scientists to home in on an explanation of the gamma-ray flares. The Chandra data provide strong constraints on the behavior, at relatively low energies, of the particles that have been accelerated to produce the gamma-ray flares. Another possible explanation follows if the gamma-ray flaring occurred in regions very close to the pulsar. Then they would have been missed by Chandra, because the Crab pulsar is so bright that the detectors are in essence "overexposed" so variations from that region cannot be observed. Note that in the movie an artificial source of constant brightness is included to show the position of the pulsar. The Chandra observations were led by Martin Weisskopf and Allyn Tennant of NASA's Marshall Space Flight Center in Huntsville, Alabama. Other team members included R. Blandford (Stanford U. ), R. Buehler (Stanford U. ), P. Caraveo (Ist di Astrofisica, INAF, Milan), E. Costa (Ist di Astrofisica, INAF, Rome), D. Horns (Universitat, Hamburg), C. Ferrigno (Integral Science Data Center), S. Funk (Stanford U. ), R. Mignani (MSSL), A. Lobanov (Max-Planck Inst for Radio Astronomy, Bonn), A. de Luca (Ist di Astrofisica, INAF, Milan), M. Tavani (Ist di Astrofisica, INAF, Rome), and Y. Uchiyama (Stanford U.). The story by Sir Arthur Conan Doyle is "Silver Blaze,"
In the video of the Crab Nebula I noticed a brightening, at a time about in the middle of the detailed slow-motion part. This brightening was in the form of a thick horizontal line that momentarily appeared in a relatively dark area. This area was located to the left of the pulsar, about one-half the way from the pulsar to the left edge of the nebula. What would this be classified as? Reminds me of a famous author of the 19th Century:Mary Baker Eddy, who wrote in Science and Health-"They will no longer look up to the Stars, but down from them upon the Universe"! If one would gaze at it for awhile, even with the help of a magnifying lens, one cuold almost fell BEING THERE! Beautiful color photography: below on this super Cradled Planet Earth! If Terrorist would blow up Earth as the next great target after the Twin Towers, who in the rest of the Universe would give A-DAM about us and these Terrorists: We are not even located in a prominent Galctic area of recognition! There has been a lot discovered about the Crab Nebula. I would very much like it if someone would write a very good book on the Crab telling of what occurs in it and write it for the educated layman. It could be a history of this nebula up to our present day. Outstanding, will follow, the such later. It's difficult to imagine what is a body of "nothing but neutrons" spinning 1800rpm, held together only by gravity. Now, if only I knew what gravity and neutrons really are. Amazing, wonderful, no words to express feelings. To watch time-lapse movies of a celestial object such as the Crab Nebula is mind blowing when you think of the scale you are looking at. Astronomy, the Universe never get boring or mundane. They grab you by the shoulders and demand that you witness their splendor. A thought comes to mind of a famous saying by a certain Vulcan science officer when viewing the wonders of the Universe "Fascinating".